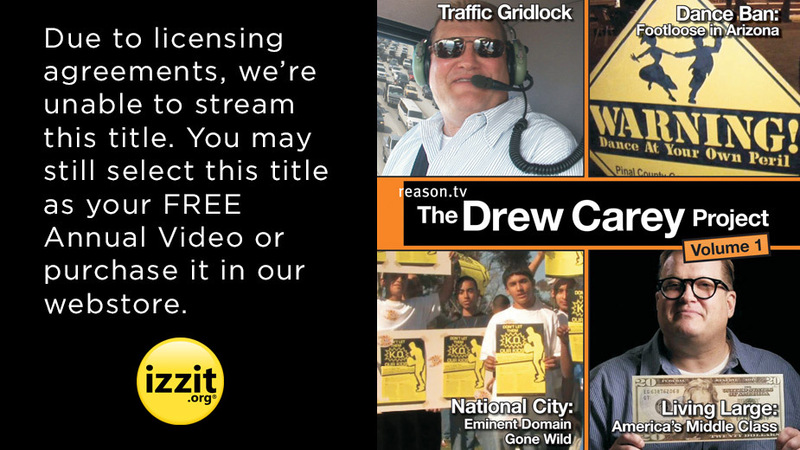 Drew Carey hosts four videos that challenge some commonly-held assumptions. "Traffic Gridlock" highlights innovative private-sector solutions to the problem of traffic congestion. How does a speedy trip on the "Drew Carey Freeway" sound? How about a helicopter ride to work? "Living Large" challenges the claim that the American middle class is being squeezed. The media and politicians tell us that it's all doom and gloom for those of us who are neither millionaires nor welfare cases. What do you think? "Dance Ban" is a modern-day "Footloose" story. In Arizona, a steak house featuring live music went into business. Then the county officials invoked an ordinance that banned dancing. So go ahead and eat— but watch that toe-tapping! Officials in "National City" (California), a predominantly Hispanic community, pushed to tear down an athletic center for struggling kids to make way for luxury condos. Why would they do that? I really appreciate the short videos and accompanying questions and discussion activities. There is just enough content and length to the videos while allowing time for discussion and debrief within a one period class. Thanks! My students like seeing the videos and discussing how these topics affect our society too. That leads to great journaling and open forum as well as greater level of thinking. All the key things for a lesson. This video was a great addition to my senior government classes. It provided clear examples of the issues surrounding government and allowed for greater class discussion dealing with the role of local governments. Since we live in Arizona, the segment on zoning and the restaurant was especially relevant. I had my students look up the status of the law suit and do a mini report. I also like the segment on freeways. Phoenix, Arizona is getting gridlocked like LA but we are not really doing anything about it except building a limited area light rail that averages 15 miles an hour. Keep these thought provoking DVDs coming. First of all, izzit.org provides FREE DVDs for teachers! Second, they are quality and current! Finally, I used the Drew Carey Project Volume 1 and it sparked a wonderful discussion time and time again in my classes. I actually had kids from other periods discussing the topics outside of class and reporting back to me. This program is a refreshing new addition to my curriculum! Thank you izzit.org! This video surprised my students. They didn't expect a video that encourages them to think at a higher level than what is normally expected of them in school! They love the controversy. The presentations are informational, thought provoking and quirky (which students love). They provide a great opportunity for socratic discussions and I find that all students are able to respond during discussions.